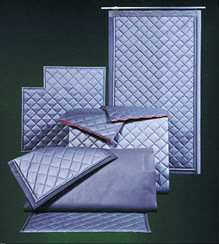 Foam or fiberglass core, faced with quilted aluminized fabric. Effective and durable sound absorber with mass loaded vinyl sound barrier option. Effective solution to a wide range of unusual noise problems. Machinery and work area enclosures.